And as technology becomes a bigger part of care, how do we ensure it helps rather than hinders progress towards society valuing care better? Photo by Matthia Zomer. Adapted by James Barclay. 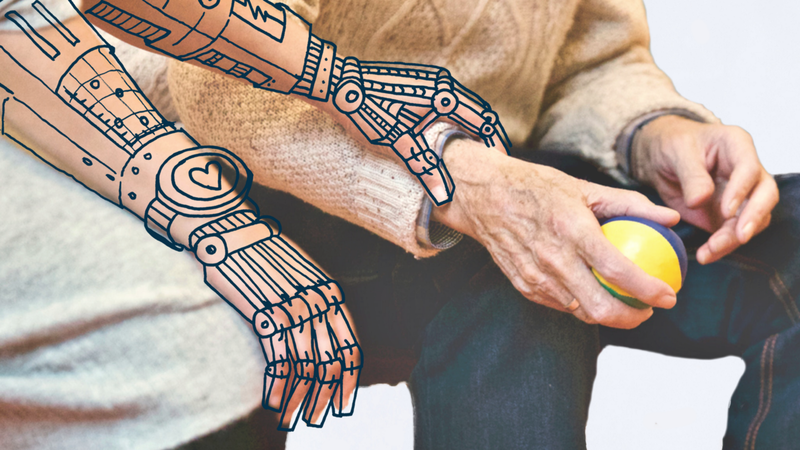 Doteveryone is currently running a project to explore how we can build better and fairer care systems in a future of robots, exoskeletons and smart homes. Throughout the Better Care Systems project, we’re talking to carers, care professionals, technologists, activists, and people who use care services, (and many who fall under more than one of these too-limiting labels) about the current challenges and asking them to imagine possible new alternative futures of care in which the system is fairer, more sustainable and more effective. This is the first in a series of posts reflecting on those conversations about the reasons for, and impact of, society undervaluing care. We know that the care sector is in crisis. The funding deficit is catastrophic and staff shortages are worsening. Local authorities and providers are going bankrupt, while staff are often miserably paid. Support for people who care for loved ones is collapsing, and many families are reaching breaking point. The care support that is offered, often fails to provide those it serves with dignity and safety. A loneliness epidemic is stunting the lives of our most vulnerable people and a UN inquiry found the UK guilty of “grave and systematic violations” of disabled people’s human rights. Our current care system is not working, and it cannot keep up with growing needs. Despite the urgency, there seems to be little political will for reform and bold policymaking. Hopes that technology will save us reach the media, but with little real detail about how this would work or who would pay. The government’s green paper on social care has been continually delayed, and there is little hope that it will bring radical solutions when it emerges. This political paralysis comes because the crisis is a symptom of deep and difficult systemic problems in how our society handles care. But while they are particularly stark within the social care sector, these problems run through our economy and wider culture, affecting all of our everyday work and lives, our productivity, resilience and wellbeing. So why don’t we care more about care? As a whole society, we are failing to value care. We struggle to measure care properly and so to understand it. But we also do not respect care work, the people who care and the people who need care. An enormous part of our economy and society is under-resourced and overlooked, and we are all suffering for it. What’s the CONTEXT for undervaluing care? The reasons we are failing to value care are complicated. They are cultural as well as practical. As an individualistic society, we do not like to think about needing help. We definitely do not like to think about being supported to use the toilet, or becoming so confused and afraid in the grip of dementia that we need to be patiently helped to eat or wash. Confronting social care needs, or admitting that we have needs, is uncomfortable. In a capitalist society, we often believe people are worth what they produce. People who are unable to work may not able to pay for the services they need. When society fails a person, we too easily assume this is because of a failure of the person. We end up accusing vulnerable people, as the UN inquiry found, of “being lazy or putting a burden on taxpayers”. Harmful stereotypes also affect the work of care and the people who do it. It is assumed to be easy or simple, low-status and even shameful — a “glorified bottom wiper” as one frustrated carer memorably put it. While many people work in care, the majority (82% of the social care workforce) are women and an image persists of it as women’s work; more than that, something that women should do out of love or duty. All this is in part due to the difficulty of capturing in data what is important about care - empathy, trust, gentleness, problem-solving, creativity and ambition for a better life. Good care is the difference between being kept alive and having a life. Too often care work is reduced to tick boxes, and care workers are pressured to function like machines. And what are the CONSEQUENCES of undervaluing care? Failing to measure care, and to respect care work means that we do not provide resources for it to work well. Our services become brittle and fragile; people fall through the cracks, problems are missed until they escalate and become more expensive. Our most vulnerable people are warehoused- kept alive but given no chance of a real life. This attitude leaks into all of our work and lives; we may share a video of a shop worker taking time to support someone with additional needs, or post on Twitter about the call centre worker who helped someone with support needs understand a service, but when taking that time means targets are missed they may well still lose their jobs. But this is not to say that all tracking or measurement is bad, nor that automated systems always make things worse. Data can be enormously powerful in managing complex systems, allowing us to check quality and consistency in care. It can help care professionals, loved ones, people who use care and support services feel protected and supported. But under pressure, data can take the place of understanding and targets can overtake need. These challenges are not new or exclusive to care. We are familiar with the agony of target culture pressuring hospitals to make patients queue to be allowed onto the queue so that the “real” queue never got too long. The pressure on schools to “teach to the test” with children forced to cram facts rather than to understand. In care, the problem is exacerbated by stereotypes of care workers as low skilled and low status. And the lack of respect for those who require care means it is particularly hard for them to challenge inaccurate or problematic data. Then because, as a culture, we often fail to place real value on our social needs, we expect these needs to be met as a side effect of other activities. What’s the future of care? When asked to imagine the future, very few of us would describe care facilities and grey hair. But one of the very few certainties about our next 50 years is that we will be older, more of us will be living with long term conditions, and nearly every person reading this will either require care or be managing the care of loved ones. Asking questions about the future of care are uncomfortable but they are urgent. It is difficult to measure love, to put a number on happiness, on empathy and understanding, to metricise a friendship, or to assign a score to dignity. We have spoken to people who are trying to do this, and to people who think it is impossible, and to those who think it is inappropriate to even discuss. The only thing that is clear is that we need open conversations that include those being affected right now. At Doteveryone, we champion Responsible Technology. And this requires considering the context within which technology develops and the consequences of its implementation. And as technology becomes a bigger part of care, we must have an open, informed and creative conversation about its values and ethics and include everyone involved. Right now many investments and developments are steered by the pressures of austerity cuts, by unrealistic hype over specific technologies such as robotics or AI, by problematic power divides and prejudices. The ideas we embed into systems now, will likely steer its ongoing development and affect all our lives in decades to come. We need creative, radical approaches and new visions of care which are developed by the people who receive care and support as well as the people who give care. This is a huge field and we welcome input and feedback from those with experience and expertise to share. We want to hear about how people experience care now and work together to explore what a radically different future of care could look like. We’ll be sharing the emerging ideas over the coming months, the first will be with an essay which looks in more depth at the narratives and measurement of care, both in and out of the social sector.